This year, I jumped on the 'Coconut Oil' bandwagon. And boy - I have not even thought about looking back. Coconut oil, plain old, cheap, supermarket brought, coconut oil. A gift to this earth. I had always seen Bloggers and YouTubers ranting and raving about the wonders of Coconut Oil, so I took the plunge. After bleaching my hair, following the 2016 ombré hair-craze, I have to admit, left my ends extremely brittle and in the worst condition. But hey! What is done is done. I was using hydrating hair products as if they were going out of fashion. There is an audience for damaged hair, a huge audience in fact, and therefore, these companies, with their 'magical serums' whack up their prices like nobodies business. Yes, some that I've tried do work - but Coconut Oil, has given me the exact same results. It's cheeper, and it's far beyond being a brilliant hair mask. Before I get into my rave about Coconut Oil, I would like to stress the need to patch test first to avoid skin reactions!!! So, just what can you use it for eh?! I've already raged about the benefits it has on my hair. If you didn't already know, Coconut Oil is actually not a liquid oil at room temperature, however it will melt with body warmth. So when it comes to melting the oil for my hair mask, I put a teaspoon of the Coconut Oil in an egg cup, and then I pop it in the microwave for a couple of seconds, checking every so often, it usually takes no longer than 10 seconds, but keep checking, as you only want it melted, not piping hot. And then I pour bits at a time into my hand, and run it through my hair! I leave it for at least 30 mins (the longer the better) and then hop in the shower and wash my hair as normal. Rubbing the oil into your roots also helps with hair growth, but can result in greasy hair slightly quicker. Top Tip: Shampoo your hair whilst it's still dry to help get the oil out more effectively! Coconut Oil is super hydrating for the skin. Although can obviously leave a very oily residue. It's a perfect night time moisturiser, hydrating your skin while you sleep. I do not only use this as a facial moisturiser, but an all over body. Particularly in the winter, my skin gets particularly dry. After a hot shower apply a small amount of Coconut oil into the palm of your hand and watch it's solid consistency melt with the warmth of your body temperature and begin lathering it all over your body! Very natural, very hydrating, and coconutty! Eating Coconut Oil has incredible benefits! There are numerous plus sides to consuming it...however the concept has never really appealed to me, as the texture is slightly odd, and although I love the smell of Coconut, I've never been a massive fan of the taste personally, but persistence is key. Since using Coconut Oil as a moisturiser, I have noticed a massive different in the strength and growth of my nails. They were never particularly brittle, but they are much healthier, and grow much quicker. 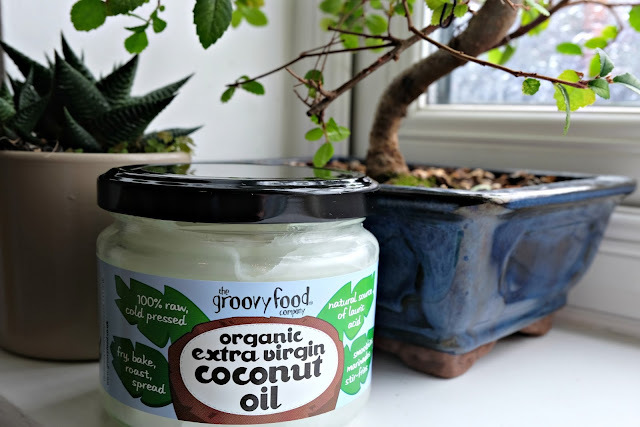 There are so many benefits of using Coconut Oil, these are just the minor few that I've tried and tested. For a more extensive list and deeper insight visit BalanceMeBeautiful.com . It's my saving grace! I recommend it to everybody I meet! I'm obsessed! Every girl, and every man, should know about the wonders of Coconut oil! You will have to let me know how you get on with it if you do buy some! Glad you enjoyed lovely!